Attic Threads & Quilts: Mystery Quilt Month 3 - Look Kevin, I Can Do Scrappy! and My BIG News!! Mystery Quilt Month 3 - Look Kevin, I Can Do Scrappy! and My BIG News!! Mystery Quilt Month 3 - Look Kevin, I Can Do Scrappy! Three months in and I'm excited to say, "ALL OVER THE WORLD!!" 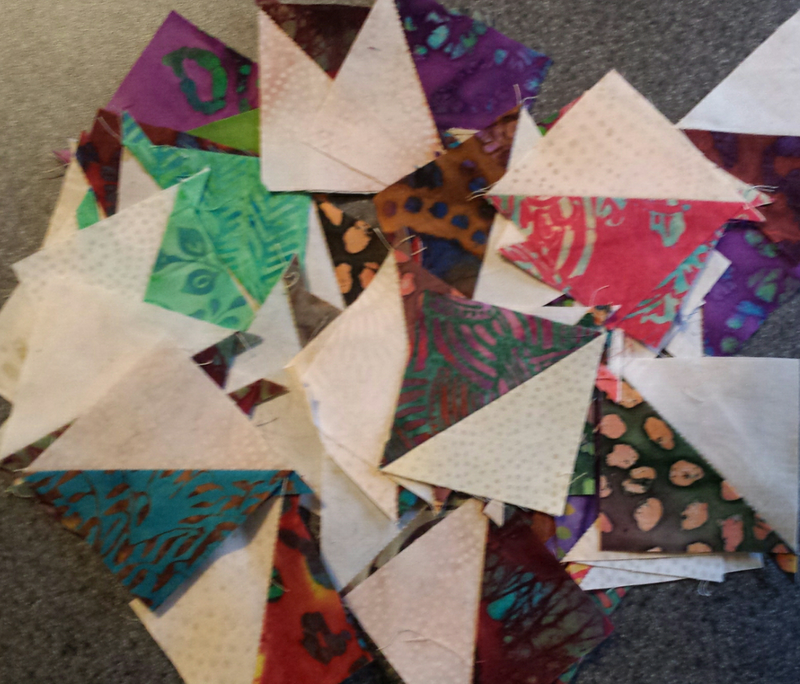 Quilters are stitching those pesky 1/2 square triangles thanks to me. Ok, maybe not just because of me, but we do have an awesome number of quilters participating in our Mystery. I think Quilters in Australia are the furthist. As we start Month 3, remember - each month's directions will be posted on the 2nd Tuesday of the month, for 6 months. 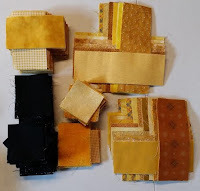 If you or your local quilt guild would like to use my pattern for this Mystery Quilt, please feel free. You have my permission to make copies for your guild. All I ask is that you give me credit for the pattern If you would like it in PDF format, please email me (atticthreads@yahoo.com) and I will add you to my email list. Month 3—A Whole Lot of Easy-Peasy Piecing! This month you will be doing a lot of chain piecing. My only rule for myself was to not worry about my fabrics looking good next to each other. (ok, so it still couldn’t be same touching same…) Just grab and sew. 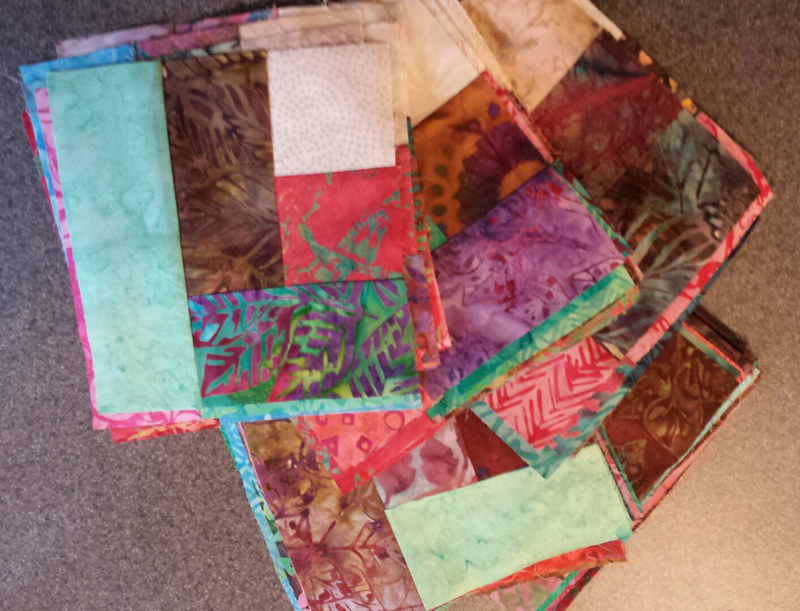 This block is dedicated to my friend Lee Etta, who makes the most beautiful scrap quilts. She has tried to explain to me the "How-To's" of scrappy several times! I think it finally took. You will have 76 Lee Etta’s Corner blocks measuring 6.5” x 6.5”. Be careful to build your blocks on the proper side! Here's a picture of mine all stitched, pressed and ready, not stitched in the correct order! Easy to do, harder to un-do! Don't forget, please send any pics of your fabric or blocks. My friend Kevin, the Quilter, sent me a pic of his cut fabric, blacks and golds! He's swapping the dark and lights. WOW, It's going to be stunning! 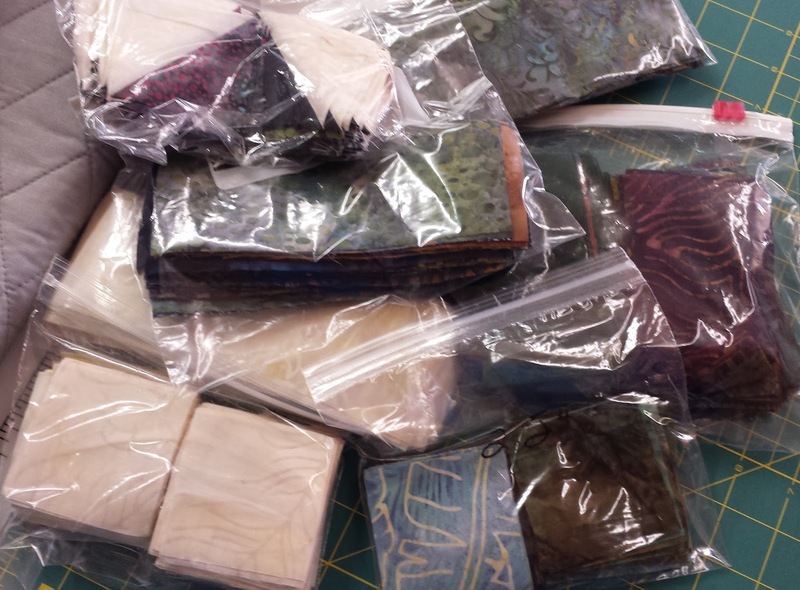 Shhhhh....While visiting my friend Susan, I found her Mystery Stash, cut, labeled and ready for sewing! I have been eagerly waiting for the next step - have finished up a number of projects and looking for something to just chain thru the machine. This is a good month for chaining. I'm glad you're enjoying my Mystery! Please send me pics if you get a chance! COngrats on the Teaching gig!!! You will be fantastic!!! Thanks Alycia, I hope to see a lot of friends there and make a lot of new ones. Quilters are the best!